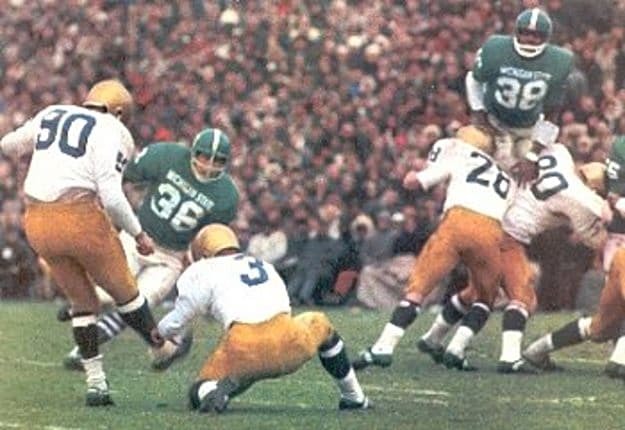 The Spartans '66 co-national title team is badass for a couple of reasons: one being that they weren't the pansyass '66 Notre Dame co-national title team that didn't even make an attempt to score in the closing moments of the tie ballgame in the two schools' end of season tilt, resulting in a split national chip. The other is that MSU produced four of the first eight players in the following year's NFL draft, none of them more badass than defensive end Bubba Smith. The Michigan State student body's chant for their star defensive lineman? The succinct, if not literally followed (we hope) "Kill Bubba, Kill." Fortunately, Bubba was far nicer in all those Police Academy movies.